Good Choice Reading: You're Invited To A Twitter Party!!! You're Invited To A Twitter Party!!! How: Be sure to follow @AlexBracken, @HyperionTeens, and @TheBookCellarX and use #InTime during the 1-hour event to ask questions LIVE and win prizes. · To join the party, just search #InTime on Twitter. · Watch for questions from @TheBookCellarX and win awesome prizes including promo codes for In Time, autographed copies of The Darkest Minds, compass necklaces, and a $200 Visa card! · Ask Alex questions, enter giveaways and chat with other partygoers—just use the tag #InTime in all of your party tweets! 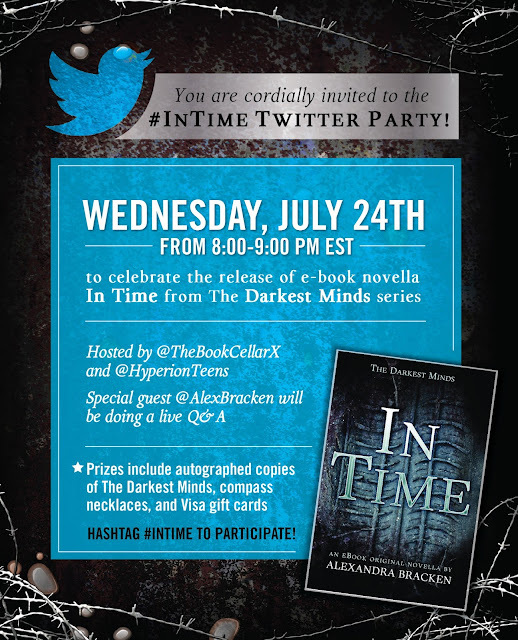 Tweet your questions for @AlexBracken now using #InTime and participate on Wednesday, July 24th for her live responses!